The lanyard and lanyard ring have been around almost as long as handguns themselves. Originally, mounted cavalry used the lanyard to prevent the soldier from losing his gun. The lanyard was looped around the waist or shoulder and connected to a ring mounted to the bottom of the grip frame. Many manufacturers who produced revolvers for the military often included a lanyard ring per government specification. Colt, being one such manufacturer, produced many of its guns for the military with lanyard rings including black powder revolvers, Single Action Army models, and the 1911. The early 1911 models produced for the military had a lanyard ring on the bottom of the main spring housing. Modern shooters are rediscovering the value of the lanyard so some after-market 1911 parts makers are producing main spring housings with a lanyard ring. The single action revolver is the perfect gun for carrying in the woods while hunting or backpacking. However, the gun can still work itself free in heavy brush even when carried in a well-secured holster. A lanyard connected to a belt and lanyard ring can help prevent losing, and perhaps never recovering, a valuable firearm. 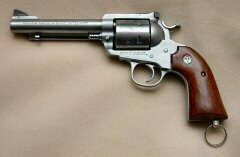 I have a stainless steel Ruger® Bisley Blackhawk® with a 5 1/2“ barrel that I plan to carry as a backup when I go hog hunting. I certainly don’t want to risk losing it in the woods, so I installed a lanyard ring. One of the easiest ways to install a lanyard ring to a revolver is to attach a sling swivel stud to the bottom of the grip frame. First, I made sure my revolver was not loaded, then disassembled it enough to remove the grip frame. (Refer to my article Ruger Single-Action Revolver Disassembly/Reassembly and Spring Replacement.) I removed all loose parts from the grip frame, i.e. hammer strut, mainspring, and mainspring seat, trigger return spring and pivot pin and set them aside. 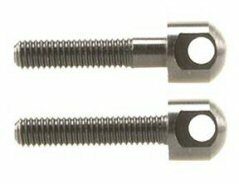 I purchased a package of Uncle Mike’s 7/8” nickel machine screw sling swivel studs. The stem of these studs is not threaded all the way to the top, so I used a 10-32 die to finish cutting threads to the base of a stud. 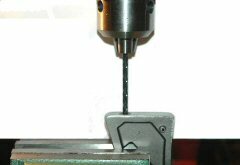 I put the grip frame upside down in my machinist vise and used a #21 drill to drill a hole. The location of the hole is not critical, so exact measurement is not necessary. However, I did locate the hole towards the rear of the grip frame, and centered it on the width by eye. I then used a 10-32 tap to thread the hole. I made sure to use plenty of cutting oil to lubricate the tap. 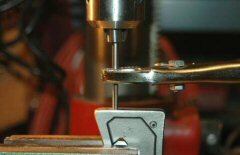 I always use my drill press and vise grips to ensure the tap starts straight. I tighten the chuck just enough to keep the tap straight, but still allow it to rotate freely. After threading the hole, I thoroughly cleaned off all traces of oil and cutting chips. I cut the stem of the stud to 1/4” in length using a cut off wheel and my high-speed rotary tool. I put a drop of blue thread-locker on the threads, then installed the stud. I had to install a flat washer because the threads were cut in such a way that the hole in the stud did not properly align. With the flat washer in place, the hole in the stud now aligned parallel to the frame. To finish my lanyard ring installation, I installed a one inch split key ring into the hole in the sling swivel stud. I can now attach a spring hook to the ring, which in turn is connected to a lanyard. Typically I use a length of 1 1/2“ nylon webbing with a plastic spring hook looped over my left shoulder. The plastic spring hook connects to the lanyard ring. I got this idea from Junior Doughty’s excellent web site The Frugal Outdoorsman. In fact, you can purchase ready-made slings from Junior, just click on the link.